In Russia, monster does not scare you. You scare monster. Case in point, the shape-shifting Slavic household spirit called the Domovoi, literally “he of the house” (Belarus “Damavik”; Polish “Domowik”; Russian “Domovoj”; Serbian “Domaći”, Ukranian “Domovyk”; Slovak “Domovik”; Czech “Dědek”), a pleasant addition to home and hearth in a harmonious house, but akin to a fearsome poltergeist when domestic strife dominates, when not properly propitiated, or in regards to problematic neighbors. “The domovoi, or house fairies, are a very moodish lot. You must not mention their names after twilight, and if you ill-treat them they will make sleep impossible. If your house is blessed with good domovoi who love you and your children, they will do many things for you — they will take care of the horses, watch over your daughter, see that she gets a good suitor, and will never let you or yours know starvation” (Wright, 1917, p123-124). 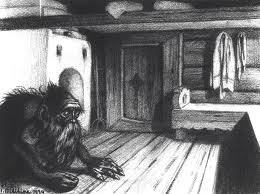 One of the most curious and widespread beliefs of the peasants is that every house contains a domovoi or house-spirit. Russian peasants catch glimpses of the domovoi about as often as Americans see ghosts, but they all believe in his existence. The domovoi is described as a little old man, no bigger than a five-year-old boy. Sometimes he is seen wearing a red shirt, with a blue girdle, like a moujik on holidays. At other times he sports a suit of blue. He has a white beard and yellow hair and glowing eyes. Though mostly invisible, the peasants firmly believe that he is always about the premises and busying himself in their affairs. His usual hiding-place is understood to be behind the big brick stove that forms the chief feature of a Russian cottage. When the people are asleep he issues forth and conducts himself amicably or otherwise, according to the humor he happens to be in. The domovoi is mischievous as a monkey, and like that animal is inclined to fly into a passion at very short notice if he is not satisfied with his surroundings and treatment. Many peasant families after eating supper always leave a portion of food on the table for the domovoi, who would otherwise consider himself ill-treated and disturb their sleep by pounding on the table with his fist (Thomas, 1891, p292-293). The natural form of the Domovoi reportedly ranges from a hirsute, small, long-bearded man to a slightly more ghoulish dwarf-like creature with horns and a tail (likely a late overlay via Eastern Orthodox Christianity that associated common pagan house spirits with devils), but it is believed he can assume the form of the resident family members, their dead ancestors, or family pets. In theory, every Slavic home has a Domovoi living under its threshold or stove and it is traditionally the home’s guardian, rewarding respect with assistance in chores, providing pre-cognitive warnings of danger to household members, and generally protecting the home, but when angered through poor upkeep of the household, profane language or general neglectful attitudes, the Domovoi becomes an evil spirit, exhibiting poltergeist-like behaviors, and credited with playing nasty tricks, moving and breaking objects, making all manner of cacophonous sounds, and when left unappeased, can escalate to suffocating people in their beds. The Domovoi or household demon is that one most commonly to be heard discussed by the peasants at work and at rest, at market and fete, on festival days and the holidays in honour of any official function. ‘What will the Domovoi do to-day?’ is the peasants’ first thought. What can he do? Much. He haunts dwellings and plays disagreeable tricks on unsuspecting housewives and their husbands; but he can also be domesticated and made almost harmless. However, he is none the less feared, and the peasantry often allude to him as ‘ grandfather.’ Peasants, as a rule, tell me that the Domovoi cannot be seen, but those who have been honoured by a private view are looked upon with nothing short of veneration. By these the Domovoi is stated to be in possession of a rasping voice, and to be covered with soft hair, like the down on a baby’s skin, even to the palms of his hands. His principal occupation is to hide in stores, cupboards, boxes, and moan dismally, occasionally asserting himself by sitting on men’s chests while they sleep (Byford, 1914, p46-47). Scholars have pondered if the origins of the concept of the temple can be found in what has been termed “the Threshold Covenant”. That is to say that the first sacred space was the home, visible in almost universal traditions of the sanctity of the entrance to the home. “The primitive altar of the family would seem to have been the threshold, or door-sill, or entrance-way, of the home dwelling place. This is indicated by surviving customs, in the East and elsewhere among primitive peoples, and by the earliest historic records of the human race. It is obvious that houses preceded temples, and that the house-father was the earliest priest. Sacrifices for the family were, therefore, within or at the entrance of the family domicile” (Trumbull, 1896, p.3). The Domovoi is often reputed to live underneath the threshold of a home or beneath the stove (the symbolic pre-religious altar around which family life revolves). Coupled with references to Domovoi by the title “Grandfather”, his existence would seem to be a vestige of ancestor worship coupled with the threshold covenant. If, indeed, the earliest dwelling of man was a cave, rather than a tent, the household fire was still at its entrance; and the threshold was the hearthstone. When, in the progress of building-changes, the hearthstone was removed to the center of the building, or of the inner court, its sanctity went with it, as the place of the family fire. Thus, for example, in Russia, theDomovoi, or household deity, who is honored and invoked at the threshold, “is supposed to live behind the stove now, but in early times he, or the spirits of the dead ancestors, of whom he is now the chief representative, were held to be in even more direct relations with the fire on the hearth; as were the Penates of the Romans, who were sometimes spoken of as at the threshold, and again as at the hearth (Trumbull, 1896, p.23). The Soviet Union actively promoted the “disenchantment” of society by rooting out what they termed superstition and religion, ostensibly intent on replacing theology with science, rationality, and philosophical materialism, but the Domovoi began to metamorphosize prior to the ascendancy of communism in Russia, beginning with its demonization by the Eastern Orthodox Christian Church. Max Weber’s modern “world robbed of gods” is characterized by “rationalization and intellectualization and, above all by the disenchantment of the world”, but this seems perhaps too much to lay at the doorstep of modernity alone. Certainly, communist philosophical attitudes towards organized religion rejected it as a rival for the hearts and minds of the proletariat, but rejection of “everyday” paganism preceded this, and one might argue that organized religion has its own version of modernity, and increased intellectualization and rationalization in the form of demonization. Associating the process of demonization with intellectualization and rationalization may seem counterintuitive, but when you consider orderly and hierarchical Christian demonology in comparison to the relative anarchy of pagan folk beliefs, where a veritable zoo of entities equally benign and malevolent require appeasement, the transfer of both good and evil to respective hierarchies, offers a total dominion over the identification of the sacred vs. the profane. I would not go so far to call this modernity, but rather a consolidation in the march towards modernity. The Domovoi experienced an evolution from benevolent domestic spirit to demon, mirroring the transformative trajectory of Slavic theology from the eastern Slavic cult of ancestor worship to Christianity, so that what was once the guardian of household affairs became subject to rituals of protection, and developed many of the attributes we associate with the Devil. “The figure of the Domovoi had its origins in the ancient east Slavic cult of ancestors, and this is no doubt most evident in the domovoi’s guise of a dead ancestor. Along with reverence for mother Earth, faith in the existence of the domovoi was one of the most long-lasting aspects of Russian paganism, for belief in the spirit generally remained steadfast among a large section of the rural population at least until the beginning of the twentieth century. Moreover, it appears that for a long time the image of the domovoi remained free from the stamp of Christian notions about the devil” (Ivantis, 1992, p61-62). Steadfast belief in the Domovoi among Slavic cultures persisted well into the 19th Century, if not the 20th. Particularly interesting is the fact that the Domovoi for a good portion of his history was actually credited with defending the home from external goblins of more malign intent. “Teraphim, Lares, genii, were ancestors of the guardian angels and patron saints of the present day they were oftenest in the shapes of dogs and cats and aged human ancestors, supposed to keep watch and ward about the house, like the friendly Domovoi respected in Russia; the evil disposition and harmfulness ascribed to them are partly natural but partly also theological, and due to the difficulty of superseding them with patron saints and angels. The degradation of beneficent beings, already described in relation to large demonic and diabolic forms, must be understood as constantly acting in the smallest details of household superstition, with what strange reaction and momentous result will appear when we come to consider the phenomena of Witchcraft” (Conway, 1879, p.37). The distinct theological problem with the organized hierarchy of temple-based religion resides in what to do with “friendly” monsters that persist in folk beliefs and traditions. Thus we see a slow evolution of the hairy little man that takes care of the household into what can only be described as an imp (horns, tail, associated with the devil), and rituals associated with him described as witchcraft. By the end of the 19th Century, the Domovoi was associated (officially by the Orthodox Church) with an unclean dead relative cursed by God to haunt the earth for a short period of time, contaminating the image of the friendly house goblin. “The Russian Orthodox Church fought hard and long against this domestic form of ancestor worship [the Domovoi] , as is shown in written documents stretching back into the early Middle Ages” (Mitterauer, 2010, p.80), but elements of ancestor worship were incorporated into the Russian Orthodox liturgy in the form of church sanctioned “Ancestor Days” largely due to the Eastern Church’s slightly more tolerant syncretism of Pre-Christian traditions in comparison to the Roman Catholic Church. While Russia adopted Eastern Orthodox Christianity as a religion in roughly 988 A.D., the persistence of the Domovoi traditions for another thousand years are suggestive of the underlying strength of the belief in an underlying naturalism as a theological foundation, one that could not be wholly erased by the acceptance of Christianity as were many other folk spirits of Slavic paganism, although even among the numerous critters that once haunted Slavic culture, we see syncretic tendencies, possibly due to the more lax attitude of Eastern Orthodoxy to existing legends. “Like the Russian folk spirits, the Devil was usually ‘they,’ not ‘he’. When peasants referred to a single devil (chert), they envisaged a small creature, one of a host of similar demons. Like the spirits, devils were everywhere, places of worship included” (Davidson, 2000, p64). There are certainly analogues for the Domovoi in other cultures, which no doubt is due to the near universality of the origins of religion in ancestor worship, and the early sanctity of the household as the most fundamental form of sacred space. In particular, the Celtic Brownie has been noted as being almost identical to the Slavic Domovoi. It is strange how closely the Russian Domovoi resembles the Brownie in every way, not only on account of the noise he makes in certain circumstances, but also with regard to the willingness to help in domestic work, and also by being most particular as to respectful treatment. When a peasant is going to live in a new house, he has to go through a formal ceremony. Food is placed on the table, and the new- comer bows towards each corner of the room, saying at the same time: ” Dear little lord and master of the house (khozyainushko gospodiu) receive us and let us have a rich farm-yard, substance, livelihood, and wealth.” When the peasant takes a bath he carefully avoids loud noise and talking in order not to irritate the Bainushko. Having finished, he leaves hot water and other necessaries for that worthy, and going out of the room expresses his thanks for the pleasant bath he was allowed to enjoy. When the Domovoi for one reason or another takes a dislike to people, he begins to bang and knock about in every part of the house to such an extent that the unfortunate family at last can stand it no longer and has to leave. But as a rule he makes himself useful, e.g., by prophesying future events and by giving a hand in the farm-yard. All the animals of which he is fond are healthy, smooth, and clean. When he takes a dislike to a cow or horse, he will take away its fodder and give it to a favorite animal, and will chase the other poor beast about all night. When the peasant notices in the morning that an animal looks thin and worn, he at once suspects the cause, and sets to work to set matters right. He makes a bunch of a plant called the “devil- chaser” (tshertcgon), and runs about the farm-yard dealing vigorous blows with it in all directions, and calling on the mischievous sprite to behave himself and keep the law of God. In the case of special obstinacy a more powerful means of punishment is used, viz., incantation (Dieckhoff, 1918, p239-240). No doubt if we examine the cultural life and folk theology of any culture, we can unearth the vestiges of humanity’s pre-history, the monsters that inhabited an enchanted world before modernity came along to trample lively cosmologies into dust, organized religions turned our attention to sanctioned sacred spaces for worship, and Aristotelian logic and rationality crept in as our intellectual ideal. This is of course, nothing to be stressed about as it only represents the malleability of the semiosphere. As long as individuals, groups, nations, and cultures communicate there will be an exchange and metamorphosis of symbols. No doubt, in a future century, anthropologists will look back and marvel at our culture, and comment, as Isaac Bashevis Singer said about children, “They still believed in God, the family, angels, witches, goblins, logic, clarity, punctuation, and other obsolete stuff.” Meanwhile, just in case, make sure to leave a little something near the stove for your household goblin. He’s had it rough. Baring, Maurice, 1874-1945. The Mainsprings of Russia. London: T. Nelson, 1914. Byford, Chas. T. The Soul of Russia. London: Kingsgate Press, 1914. Conway, Moncure Daniel, 1832-1907. Demonology And Devil-lore. New York: H. Holt and Company, 1879. Dieckhoff, Cyril H. “Mythological Beings in Gaelic Folklore”. Gaelic Society of Inverness. Transactions. Inverness[Scot. ],, 1918. Ivantis, Linda J. Russian Folk Belief. New York, NY: M.E. Sharp, 1992. Mitterauer, Michael. Why Europe: Medieval Origins of its Special Path. Chicago: University of Chicago Press, 2010. Stevens, Thomas, 1854-1935. Through Russia On a Mustang. Boston: Educational Publishing Co., 1891. Trumbull, H. Clay 1830-1903. The Threshold Covenant. New York: C. Scribner’s sons, 1896. Wright, Richardson Little, 1887-1961. The Russians: an Interpretation. New York: F.A. Stokes Co., 1917. Very good information here! The only thing I would point out is when comparing it to the “Celtic Brownie,” well the Brownie is found in Lowland Scotland and England but not much in the Highlands which is the Celtic part of Scotland. The Scottish lowlands are the Anglo-Saxon part. The Scottish Brownie is very close to the German Kobold and Scandinavian Tomte and Nisse, which speaks strongly to the point that the Brownie is Germanic and not Celtic. The Scottish Lowlands have heavy Anglo-Saxon heritage which has sadly been greatly downplayed for socio-political reasons, but this was always well known in prior eras.